The Federal Road Safety Corps (FRSC) says it will include the national identification number (NIN) in the biometric data capturing process of getting a drivers’ licence. Aliyu Aziz, director general of the National Identity Management Commission, made a proposal on the subject to the FRSC on Friday during a visit to the corps headquarters. 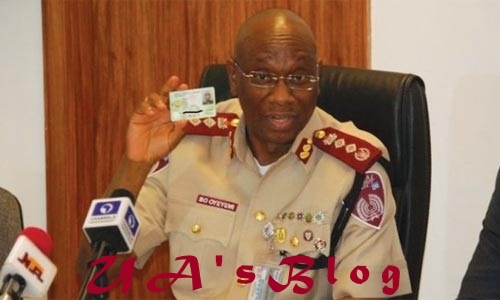 According to a statement by Bisi Kazeem, the Corps public education officer, Aliyu advocated for the corps to make it mandatory for all applicants of the National Drivers Licence to produce their national identification number at the point of registration. Speaking during the visit, the director general applauded the management of the Corps for its efforts in creating a central database for all applicants noting that the system operated by the Corps is in consonance with what is obtainable in advanced countries like the United States. He said this will go a long way in exterminating duplication of responsibility and enhance security especially in the area of information sharing. Responding, Boboye Oyeyemi, the Corps Marshal congratulated NIMC for digitalizing the entire process of getting the national identity card and expressed appreciation over the request presented by the commission. He said FRSC will ensure that henceforth, applicants of the NDL produce their NIN at registration points. Oyeyemi stated that biometric capturing processes of the various agencies in the country need to be given a uniform standard so as to align with global best practices. He also urged Aliyu to fast-track the integration of all agencies involved in biometric capturing so as to achieve a uniform standard for the entire nation.